I have a couple different set ups that I use for Scooter. I have a bit that I will use for workouts, trail riding and some basic training. 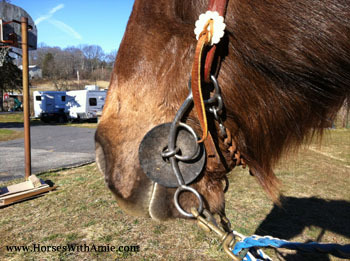 Then I have my "barrel bit", the one that I compete with and do some barrel work in. 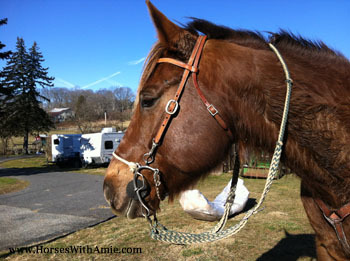 I also use a hackamore (bit less bridle) to trail ride in that I do not do any drills with. It is simply my pleasure piece. The reason you do not want to ride in your barrel bit all the time is because your horse will start to get used to that type of pressure and control. When you enter an arena about to make a barrel run or whatever event you do, you want your horse to give to the bit and respond immediately. Having a big that is less intense to do most of your riding in will keep your horse listening to the stronger bit when you need more control. I personally try not to touch the bit at all when I am riding Scooter. Instead I use leg pressure and body movement cues to guide him when I want to go. 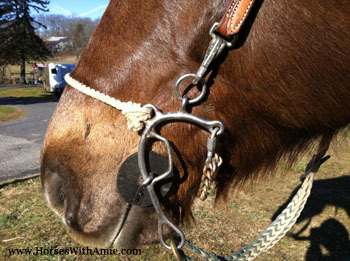 Pulling on the bit to much can sour a horse and make them push back which makes it difficult to ride. It is also better for their health in some cases because sores can develop inside their mouth from all the pulling and rubbing. This is a three piece short shank bit. I use it for workouts, trail riding and some basic training. 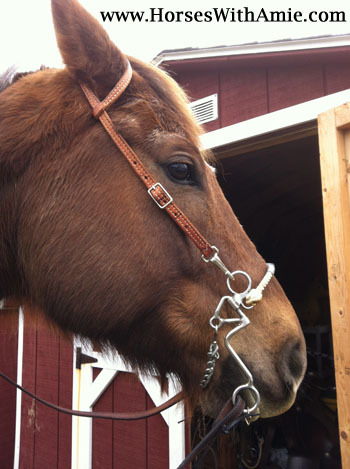 As you can see the shanks (the 'C' shaped bar that the reins and headstall attach to) are short and do not go past his mouth. It gives me a relatively quick reaction when I apply tension. This is my competition bit. It's the Martha Josey Million Dollar short shank bit. 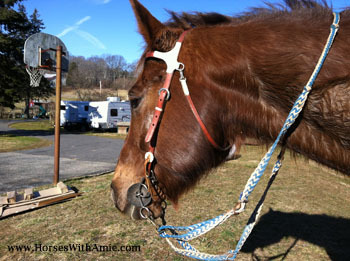 Just like my training/trailing/working bit it also has a three piece mouth bar. This bit has more of a curve in the shanks and it has a nose band. 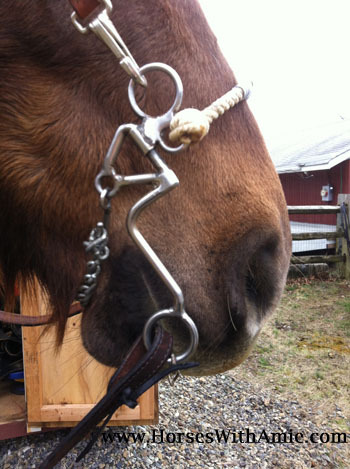 The nose band helps keep the horses head collected and applies some pressure when turning the barrel. Since this is a stronger bit I only use it when I compete or do barrel work that way scooter always gives to the bit and doesn't get sour from it. My casual headstall is a hackamore, i use it when I am trail riding or just riding around with field with no intention of an actual "workout". The reason I do not work Scooter in this set up because it does not have as much control. It is very light on their mouth and head since there is no bit attached. It just goes around his nose. Here is an up close view and as you can see this set up is just a nose band and curb chain.